As part of The Schoolhouse Review Crew, I received Super Duper Publications Auditory Memory software program to review. 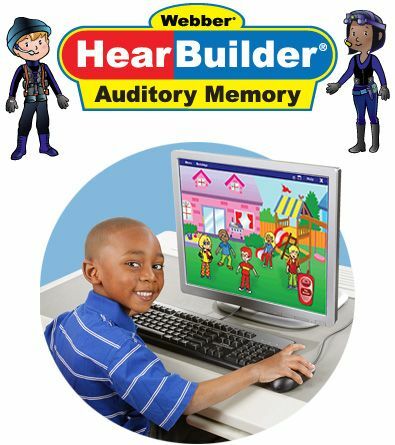 Hear Builder Auditory Memory is software for grades K-8. I used this with my almost 12 year old son who is starting 6th grade. When I saw this, I thought it would be great for my son. What 11/12 year old boy doesn’t need help with auditory memory? Think about it, how many times have you told your child to do several things, and they only remember the first one? Dr. Forgetsit, the main character in the software, makes the work fun for the kids. My older kids would gather around the computer while Zach was working, what they heard made them curious. Since the home edition can be used for up to 4 students, I think I’ll have some of the others work with this program when we go back to school next month. I just might give it a go, too! As you can see from these screen shots, the pictures are bright, colorful, and fun. While the graphics and animation are not as “high tech” as software you may be used to seeing, don’t judge the quality of the program by the pictures. This interactive software really does work to increase children’s memory. As my son worked with this software, I could see how much he progressed. The program is fun, too, so he didn’t feel like he was working hard. The program keeps track of your students progress. If you have more than one computer, make sure to use it on the same computer all the time as the info is stored on your computer. This provides an easy way to monitor your child’s progress. There are even printable progress reports. Good reinforcement for those children that need it. Here’s a video so you can see for yourself how the software works. Try Memory Builders yourself! There are 6 different sections to try on that page, so you’ll really get a feel for the program and see how it would work for your children.